The project has seen the construction of a new 18-hole course, a nine-hole par three layout and practice areas. The courses at Saliena Golf Club were originally designed by Finnish golf course architect Pekka Wesaama and opened in 2007. Within a few years, the developers invited Nicklaus Design to study the possibilities for a redesign. Nicklaus worked alongside hospitality design firm WATG to develop the concept to create Jurmala Golf Club & Hotel. Latvian construction firm Modo Golf began work in 2013. “The site was very challenging as it was located below sea-level and large parts of the site consist of peat,” said Bouts. “Proper drainage of the site and the golf course ended up being the main focus for the design and construction of the course. While keeping proper water management and drainage practices in mind, the layout has integrated the existing water bodies and added various new water features where required. 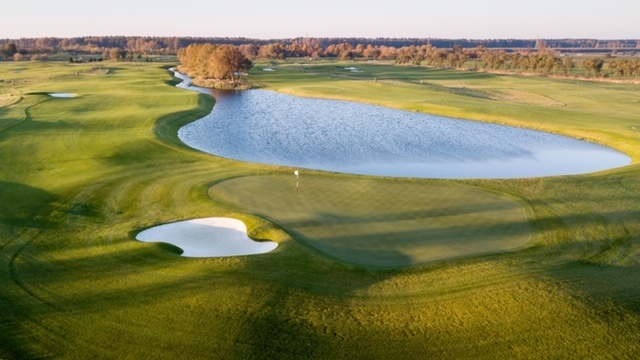 Nicklaus Design and Latvian civil engineering company Baltic Golf Development supervised the project until its completion at the end of 2017. “Great care was taken to put a professional construction and management team together along with implementing the best possible construction methods,” said Bouts. “We sand-capped fairways, installed USGA greens seeded with T1 creeping bentgrass, fitted good drainage all over the course and a good irrigation system for the dry springs and summers. “The use of a blend of Kentucky blue/fine fescue grass mix for tees, fairways and roughs keeps the maintenance simple and easy and allows for fairway lines to be modified/adjusted as per the required conditions. “The installation of a modern bunker liner – provided by Capillary Concrete – and the use of very good bunker sand resulted in dry and first-class playing conditions at all times. The grow-in phase, in 2018, coinciding with the construction of roads to the hotel and course. The golf facility opened for play at the end of 2018. “What I found particularly interesting was that with the right approach, the proper design and professional construction methods, a very average, newly constructed course was turned into a great golf facility, providing the highest standards to be enjoyed by all kinds of golfers alike,” said Bouts.